Grosmont developed mainly as a centre of ironstone mining, which flourished during the nineteenth century. From here the rock was taken to the Teesside blast furnaces. Grosmont also produced the 'Grosmont brick' from 1870 until 1957, a particularly dense brick which defies being drilled. Today, the village is dominated by the heritage steam and diesel services operated by the North Yorkshire Moors Railway which runs from Pickering to Grosmont, with an extra service along the Esk Valley Railway line from Grosmont to Whitby on some days during the summer season. See the timetables page or North Yorkshire Moors Railway website. Change train and platforms at Grosmont to connect with heritage steam services. The Esk Valley Railway shares the station with the North Yorkshire Moors Railway. Here the heritage and the service trains meet on opposite platforms. 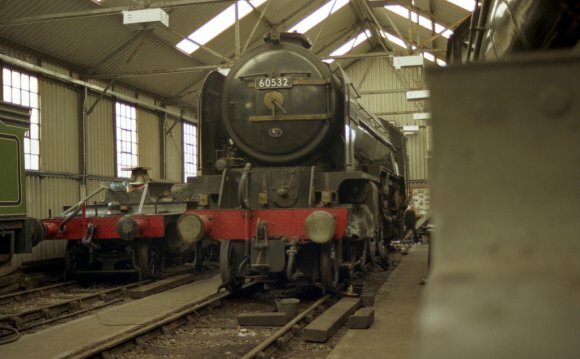 Visit the engine shed a short walk from the station to view the maintenance carried out on the steam engines. Close to the station, and visible from the platform. Paintings, pottery, crafts and sculptures from local artists. This walk links Grosmont to Goathland (3½ miles). It runs along the route of George Stephenson's original railway line of 1836. A 4½-mile circular walk from Grosmont station. This gentle stroll passes by tumbling water and through fields and woodland. The Esk Valley Walk passes through Grosmont. More about the Esk Valley Walk.